Comparison of Motorola Droid Razr with Samsung Galaxy Note the might look bit surprising, as both these devices belong to different dimensions. 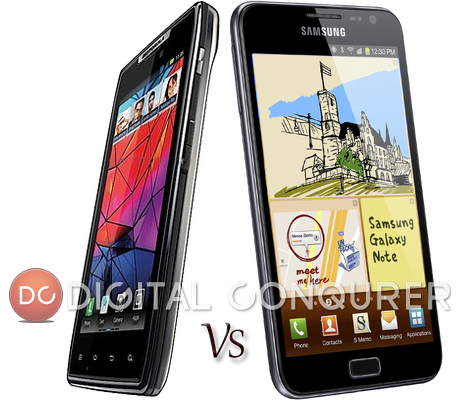 The the Motorola Droid Razr is the world’s slimmest smart phone and Samsung smart phone is the one with big screen. But still there are many things in terms of silent features that could be compared. Both the smart phones are equipped with latest technological achievements in the world, but as far as which one is better is concerned; there are several aspect which should be considered to rate the best one. Quality of Display has become an important aspect which should be the part of any smart phone and as far as these two smart phones are concerned, the Galaxy Note has the resolution of 1280×800 pixel in comparison to 4.3 inch display of 960×540 pixel resolution. Galaxy is the winner here with good margin. Talking about the size and dimension, the Galaxy Note is 145.8×82.95×9.65mm, whereas the dimension of Droid Razr is 131x69x7.1mm. In terms of body weight, both these handsets are light in weight, where Galaxy Note is 178g and Droid Razr is 130g. The difference in weight is due to the body dimension. In this category, there is no doubt that Droid Razr is ahead of Galaxy. If we talk about the computation and processing speed, then the 1.4 GHz dual core ARM Cortex A9 Processor of the Galaxy Note is better as compared to the 1.2 GHz TI OMAP4430 processor which comes in Droid Razr. Along with this, both these smart phone comes with 1 GB of RAM. It looks like head to head competition in this section. The operating system is the major component for any device, and here both the smart phone stand on the same pedestal. The Android 2.3.5 Gingerbread with Touchwiz UI 4.0 provide the extreme computing power to Galaxy note, whereas Droid Razr also run on the same platform. In terms of memory space, Galaxy comes with 16 GB of internal memory which is expandable upto 32 GB via micro SD card. Razr on the other hand comes with 16 GB internal memory and 16 GB of pre installed micro SD, although expandable memory is upto 32 GB. The quality of capture image in Galaxy is superb with 8 Mega pixels main and 2 Mega Pixel front camera. The camera in Galaxy is competent to record high definition video at the 1080P at the speed of 30 frames per second. As compared to Galaxy, the Droid Razr also has 8 mega pixels rear camera. The front camera is of 1.2 mega pixel and this brings Rarz behind in the race. In terms of sound and audio quality, the Galaxy note is compatible to MP3 AAC, AMR, WMA, WAV, FLAC, and OGG. You can listen to your favorite track on the 3mm ear jack. It also has Stereo FM radio with RDS feature. On the other hand Razr is also not far behind, it has features like has 3D stereo, Live Stage and Home Theater which make it as a competent competitor in this category. The Wi-Fi (802.11a/b/g/n/), Bluetooth 3.0, micro USB 2.0 and USB Host (OTG) 2.0 makes the Galaxy Note as a competent smart phone with enhanced connectivity in all aspects, although Droid Razr also is not behind in the race. The handset is equipped with Wi-Fi 802.11 a/b/g/n, LET connectivity which is quick enough to provide better connectivity. Bluetooth 4.0 and USB2.0 port makes the Razr, as complete high end smart phone. The battery backup of Galaxy Note is superb with li-ion 2500mAh battery as compared to 1780mAh battery of the Droid Razr. Here also Galaxy is ahead in the competition. How heavy these mobile could be on the budget is also an important aspect to be considered. The unlocked Droid Razr is available in the price range of Rs. 33,990 (USD 799.99, although you can also get it in USD 299.99 with two year contract In US). The unlocked Galaxy Note is bit expensive with Rs. 33,500 (USD 899) as compared to Razr. Apple iPhone 5 and iPad 3 Rumors Are Up Already ! Will Google Wallet Make It ? 13 Offline Dictionary Apps For Everything – Android / iOS/ Windows Phone & PC!